A young Kwakwaka'wakw woman, Megan, learns that her homeland waters are threatened by the toxic pollution her Cree ancestors warn is carried here by a giant poisonous Black Snake. Megan travels east believing she can heal her Grandfather of the cancer he contracted near the Alberta tar sands and carried by the Giant Black Snake to her Ancestral Salish Sea territory. She discovers a new is pride in her heritage as a member of the Sisiutl Clan (the two headed Sea serpent), a water protector. On her journey she works together with another man from the oil industry to adapt an old healing ceremony to transform the Black Snake before into a Sisiutl before it reaches the Salish Sea. The show features a 15 ft. Luminary Transformation Serpent Puppet and settings projected on a giant film screen behind the performers who sing and dance to original hip-hop and traditional Kwakwaka'wakw style music. 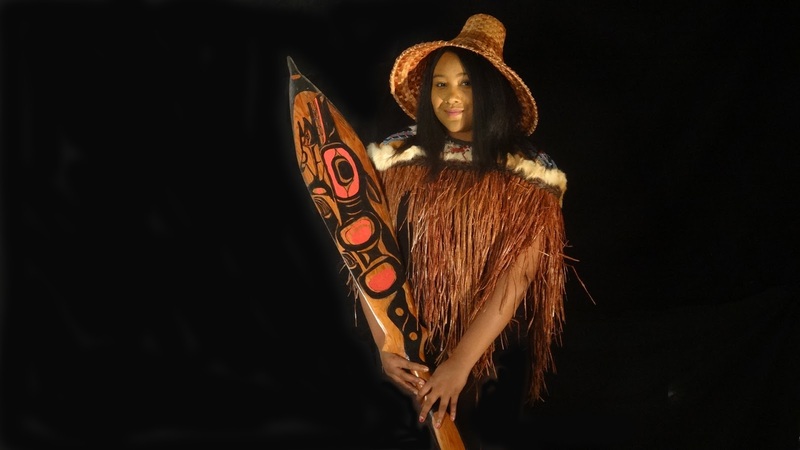 A traditional Kwakwaka'wakw story of the origin of the echo. A young man named Wakas travels with his spirit helper the Frog on the back of a Raven to a big feast house. He befriends the Mouse Woman who helps him to discover the secret of all animals. Wakas promises the animals he will keep their secret and in return the animals give him an Echo mask, song and dance. George Taylor, the Lelala Dancers and the Hamumu Theatre Collective sing and dance the Echo transformation mask still today as tribal elder Joe Seaweed did in the 1950s.